Her preference was #2 so the next step was to make a full sized one, take it to the painting to see where it should be located. This is a vital step, she had some brush work around the head that she wanted to highlight. Now it’s time to make the actual spandrel and the frame will be built around it. This one is made of 1/4″ MDF and will be gold leafed. It’s quite fragile since the sides only measure 1 3/8″. A small plunge router with a 1/8″ bit was attached to an arm (compass style) for the first cut at the top. 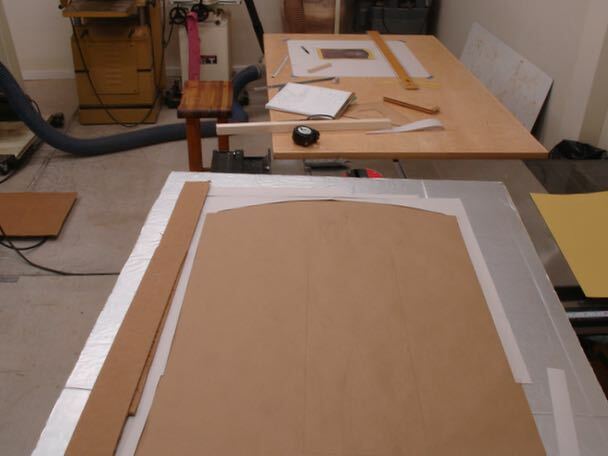 After that, the bottom and sides were cut out the same way with an edge guide mounted to the router. The final cuts to connect the arch to the sides was saved until last. These cuts will be square up by hand, chamfered and smoothed prior to gilding. Boy, that MDF puts out a bunch of fine dust — yech! Next up is making the frame itself. This entry was posted in custom profile, Design Process, Picture Frames, Tabernacle, Tutorial and tagged Christine Vallieres artist, custom picture frame, Design Process, MDF, picture frame, plunge router, tabernacle picture frame. Bookmark the permalink. Hey John, this came in while we were talking, As usual a great job and impressive work.